I've been struggling with a high DPI problem in Markdown Monster as it relates to the built-in screen capture functionality. In a nutshell, if running a second (or third) monitor that is using High DPI scaling, the screen capture selection mechanism fails to properly select desktop windows. WPF doesn't understand multi-monitor DPI scaling so it uses the first monitor's DPI setting for mapping screen locations which causes the screen capture highlight windows to be off by a given ratio. There are ways to figure out the right ratios, and manually force WPF into multi-monitor DPI mode, but there are other issues that make this very difficult (involving a bunch of native code) to solve on .NET 4.6.1 and earlier. The good news is that .NET 4.6.2 introduces some new runtime features that make WPF multi-monitor scale aware and provides system metrics correctly on multiple, scaled displays. First shot running on 4.6.2 proves the basic code that works on a single monitor, now also works on secondary monitors. Yay! Not so fast. The current version of Markdown Monster runs against .NET 4.5.2 which is typically my go to version of .NET that I use for destop/console applications. It's been out for a long time and available on just about any machine that runs at least .NET. 4.5 was released with Windows 7 and 4.5.2 was released as part of one of the follow up releases. In short - you can pretty much assume 4.5.2 is always there on Windows 7 or better machines which is all that Markdown Monster supports anyway. For the few others - well, let them download a later version. There have been very few API changes in later versions, although there have been some nice runtime enhancements (new 64 bit compiler, better garbage collector, improved memory management, DPI management improvements - all in 4.6) but really these features are all pretty minor. Until last week 4.6 and the new features were all "Meh!" to me. Until I needed a feature in the new version - 4.6.2. WPF applications are now enabled for per-monitor DPI awareness. This improvement is critical for scenarios where multiple displays of varying DPI level are attached to a single machine. As all or part of a WPF application is transitioned between monitors, the expected behavior is for WPF to automatically match the DPI of the app to the screen. It now does. In previous versions, you would have to write additional native code to enable per-monitor DPI awareness in WPF applications. Ok, so now it's time to ship 4.6.2, right? Done and done! Ack! Not what I want to see, especially when I'm running an application I just installed for the first time. So requiring 4.6.2 would come with some pain for users that I'd rather not imbue upon them. When .NET 4.0 was released and the subsequent .NET 4.5 and 4.6 releases, .NET changed direction when it came to version updates. All .NET 4.x.x Runtime updates are in-place updates replacing older versions of the runtimes. This means when you install a new version of .NET 4.x.x you replace whatever previous version of .NET 4.x.x you had previously installed. On a system that runs 4.6.2 you can run applications that require 4.0, 4.5, 4.5.1, 4.5.2, 4.6 and 4.6.1 - 4.6.2 supersedes all these previous versions and replaces all previous ones. A machine that 4.5.2 installed can run all 4.x versions and up to 4.5.2 and so on. It's debatable whether this is a good idea or not, but it does make it easy to stay up to date. When a new version comes around you can simply update and get all the features of the new runtime. All your old apps requiring older versions continue to run. New apps that want to use latest also work. And as a benefit, you also get the benefits of internal fixes and optimizations even if your app is targeting an older version of the framework. It's important to understand that you always run the same, installed version of the runtime regardless of the compiler targets. Even when you target .NET 4.0 you are running against the installed runtime of 4.6.2 (or whatever). The idea with this is that you are always using the latest runtime, which - if Microsoft is doing their job right - should always be backwards compatible: Old code should always work on the new runtime. And for the very largest part, Microsoft has upheld that premise. 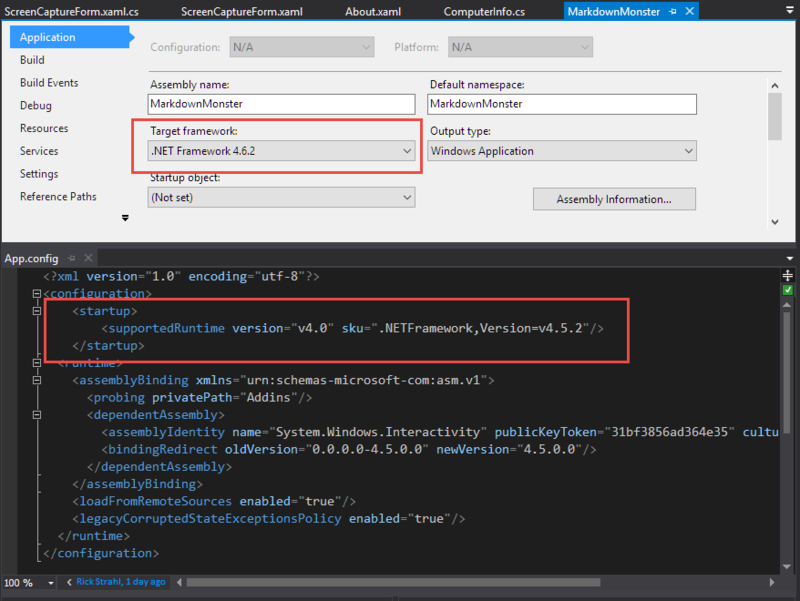 When you pick a particular runtime, .NET compiles against a version specific set of reference assemblies (see Immo's recent and excellent video on Reference Assemblies for more info) so the compiler knows exactly what's available for the targeted version. The actual installed runtime that your runtime application binds to is always the same, regardless of whether you run a 4.0 or 4.6.2 application. The version specific compiler target simply denies you access to the parts of the runtime that the targeted version does not support. The hint really tells .NET to look for that version and if it doesn't exist throw up the runtime not installed error shown earlier. The hack here is this: You can change the runtime hint and force .NET to think it's loading a different version than what you compiled against. Like it or not, for the most part this scheme - although seemingly full of pitfalls - is working out pretty well for .NET. Ok, back to my DPI Scaling problem. My issue is that I would like to use .NET 4.6.2's new features, but I don't want force a new installation hit for users that don't have .NET 4.6.2 right now. I want my cake and I want to eat it too! But! I can also specify the runtime version to a lower version in my app.config file as shown above. So compile against 4.6.2, but hint for 4.5.2. Now when I run my application it is actually compiled against 4.6.2 (ie. the 4.6.2 features are enabled), but the actual loader thinks it's running 4.5.2. If I have .NET 4.6.2 installed I get all runtime enhancements of 4.6.2. For me this means I get the new DPI Scaling features from 4.6.2 if 4.6.2 is installed on the machine. If I don't have 4.6.2 installed the app still runs but simply uses whatever features are available on the older version. It just works as long as I don't hit .NET feature API that don't exist in 4.5.2. In practice this means on my dev machine that has 4.6.2 I see the correct behavior of the application in regards to multi-monitor DPI scaling for the screen capture. On my VM that runs 4.6.1, that same code does not work. And the Win7 VM running 4.5.2 works fine, but the multi-monitor DPI code doesn't work properly there either. The bottom line is that I get exactly what I expect: It works perfect when 4.6.2 is installed, and older versions run without prompting for an .NET Runtime update. Note, given what I said earlier about running newer version of the runtimes you would think even compiling 4.6.1 should work when 4.6.2 is installed - I tried, but it doesn't work. The new DPI features only work in 4.6.2 so there must be some internal runtime checking happening in the WPF code. The big caveat with this is that if you reference any new features that are newer than 4.5.2 (what I specify in the app.config), then those features will break at runtime. Since the DPI features I'm interested in are not accessed from code, but rather are internal to the runtime, things just work when 4.6.2 is installed and fall back to existing 4.5.2 behavior (or whatever version in between is installed) when it's not. IOW - best of both worlds! Faking Runtime Versions is a hacky way to have my cake - a widely available runtime without new installs - and eat it - get newer runtime features if available. If you accidentally reference APIs that are newer you can cause errors that you may never see yourself while testing, because presumably you're using a recent runtime. Since you're running the newer version all works fine for you, but may not for those running older versions. It may be hard to duplicate those errors because you are not running that older runtime. Remember any failures then are runtime failures - the compiler thinks I'm building a 4.6.2 application so it won't be any help telling me when I'm using a newer API. You won't see the failure until that code runs and then only on a machine that's running on the older version. A good way to get the compiler to help in this scenario is to roll back your app to the runtime version you expect to be the lowest you want to run and make sure there aren't any illegal APIs. So in my case I should compile against 4.5.2 just to ensure that I'm not using newer APIs. If Ok then I can switch back to 4.6.2 when ready for the final build. In reality the deltas between .NET versions is pretty small. I can't think of any post 4.5 features I use in any of my code. For example, there isn't a single thing in Markdown Monster that breaks during compilation between the two targets. So, is this something you should do with your application? Definitely not, unless you have a really, really good reason to do so, and you know what you're getting into. Ultimately the official and best solution is to go ahead install the actual target version that you want to run, which in my case would be 4.6.2. And perhaps that's Ok for your app. Installing a .NET version update isn't the end of the world especially if the percentage of people who need to do so is relatively small. For Markdown Monster we're seeing less than half of people using .NET 4.6.2 (at least from our error logs), but with 4.6.1 we get closer to 80%. Given that 60% of people running MM for the first time would have to install the .NET runtime if I forced 4.6.2, this is not the experience I want to shoot for. It's hard enough to get people to try out new software in the first place, without scaring them off by having to install another system component for the privilege. In addition, quite a few people are skiddish about installing new versions of .NET, especially the 4.6 versions which initially had a number of breaking changes/bugs that have since been addressed and have gotten somewhat of a bad rap. For me and Markdown Monster using this hybrid approach lets me run 4.6.2 where available and lets everybody else get a less perfect experience for the multi-monitor DPI experience, but in return require no upgrade, which is a good compromise for me. If that feature is important enough to warrant a .NET upgrade, they can do so on their own terms without being forced into it. It's a compromise I can happily live with. As time goes on more people will end up on 4.6.2 (or later) and this problem will fade away. Just remember: Caveat Emptor, for you and your applications your mileage may vary. @Benny - you can do that with an API call (SetProcessDpiAwareness) as well so the manifest is really optional. The problem is that that's not enough to get WPF to play nice when creating content on multiple screens - ie. main window on one screen secondary window on another. The per monitor DPI setting works for the main window and auto-window resizing, but not if you need to put content at precise locations on secondary screens - at least not without a lot of extra tweaking. I don't know exactly what's different in 4.6.2 but there's some other magic happening in the runtime beyond just tweaking the initial DPI settings switch and it only works in 4.6.2. Doing it in code means I get to fallback to the default behavior without a manifest error that potentially leaves the app in an unstable state. @Rick Yes you get the same result (by the way nice trick with the static constructor) but you don't have to use the hackish approach to compile against 4.6.2 and target 4.5.2 If you compile against 4.5.2 and use the manifest file and you use 4.6.2 the permonitordpiawareness will work. Using 4.5.2 your app will work too, but without permonitordpiawareness. You will not get an manifest error. @Benny - I wish that were so. But it doesn't work. I tried :-) The manifest hack does indeed change the multi-monitor setting, but it doesn't actual make the application behave properly when translating positions on another monitor when not dealing with the active window. IOW, without 4.6.2 it looks that WPF can't deal with two windows on two monitors simultaneously. It can in 4.6.2. To test I tried the instructions from the document you pointed as that looked promising. It worked with 4.6.2, but when I rolled back to 4.5.2 I still see the exact same failing behavior I see with my approach of manually setting the DPI mode. There's something else they are doing inside of the WPF runtimes with 4.6.2 that is not covered by merely changing the DPI mode (and the change event handlers). It has to do with how WPF is translating the pixels on the secondary monitor when setting window positions. As it is I have to do apply a pixel ratio (ie. Scaled DPI/96) to width/height/top/left to get things to line up on either monitor. You can see this [here](https://github.com/RickStrahl/MarkdownMonster/blob/master/AddIns/ScreenCaptureAddin/ScreenCapture/ScreenCaptureForm.xaml.cs#L428) in the screen capture code. It might be that my scenario is a very special edge case (I'm overlaying specifically placed WPF windows on a Windows pixel region) and it's possible the manifest/DPI Mode settings alone would fix some other issues like the auto-resizing of windows when dragged across monitors. However all that seems to work just fine even with System aware settings for me. I would add a second VS project that has most of the content shared with the existing (by importing the main project) but set it to use .NET 4.5.2 for compilation. This way building the solution would automatically check the API usage. @Knaģis - Yeah in hindsight that would be cleaner - also for addin creation so you didn't have to reference the EXE. I may still do that at some point. What do you mean by check the API usage? A second project targeting 4.5.2 would enable compile time checks verifying that all framework methods are supported both in 4.6.2 and 4.5.2. I think that the IDE actually understands when a file belongs to multiple projects because I have seen it hinting in the Intellisense when a certain framework method is only available in one of the projects. In CommonMark.NET I did manage to set up the projects so that I have only one that shows the files in Visual Studio (so that is the one where I would add/remove files etc.) but there are others that import this project but then compile it against a different target framework. Thanks Knaģis. I have to experiment to see how this works, but adding a 4.6.2 launcher project and leaving the main project as a 4.5.2 project seems like a great way to go. Just have to get the naming right... thanks for the inspiration. What I don't understand though is, if the runtime is always the latest version, meaning WPF will call function X, which is implemented in different ways in different runtimes, but as long as X exists, it will be called and will execute whatever code is in it. So if you have 4.6.2, even if you target for 4.5.2, the runtime you have has the 4.6.2 functionality and that is the functionality that should execute, right? Also, I noticed that you mentioned that you log what framework version users have. Just wondering, do you get this info from the registry or have you come across a more straight forward way?